I wasn’t planning on writing another Living La Vida Local post so soon but I found a home decor shop that I have never heard of before and had to share this with y’all right away. Today my pal Cindy and I were going on our own little 124 Street shop crawl and we walked past the coolest looking store and just had to stop. 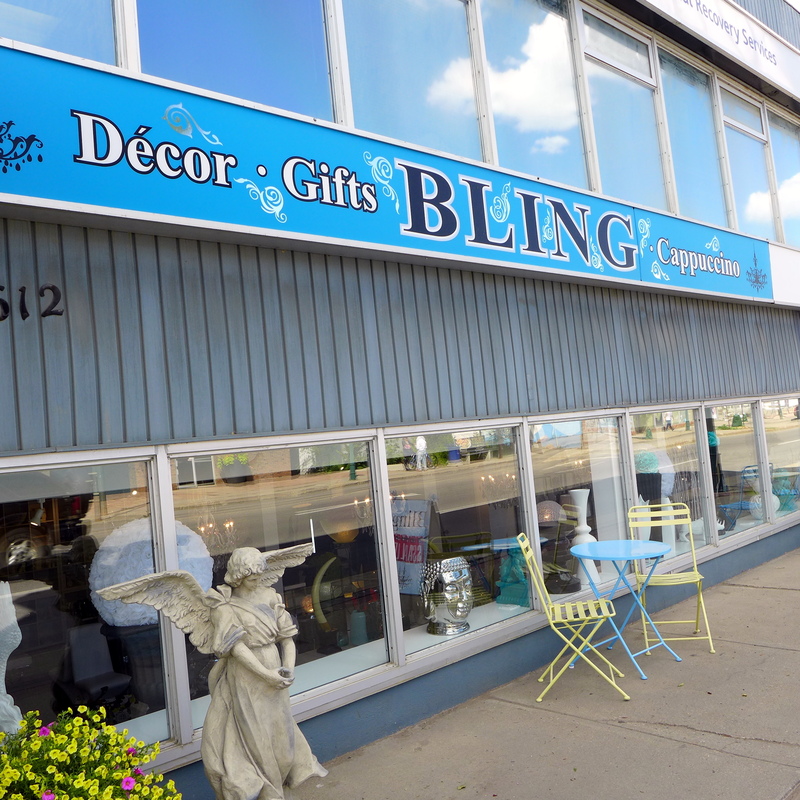 While Bling is new to 124 Street, it is not new to Edmonton as they recently relocated from their space near City Hall over to 124 Street. For the longest time I was a non-coffee drinker – in fact, despite my current love for a great cup of coffee, I was anti-coffee up until the moment of my first grad school all nighter. Even then, coffee was used as a last resort to boost my energy just long enough to hand in whatever was due. However, during that time, I started learning a lot about the type of coffee I like and becoming pickier about the coffee I drank. I struggle with pre-ground coffee from the grocery store (although it will do in a pinch) and prefer to grab locally roasted coffee beans and grind them myself, stopping in at a local coffee shop, or barring that, I do have a nespresso machine that I really like too. So why am I going on about coffee? Well, I just found out about a very cool local kickstarter that was recently launched and wanted to share it with all my fellow coffee lovers! twentyfour coffee has a kickstarter campaign going on to produce a craft coffee advent calendar – at first blush, you would think that this would already be a thing, but upon reflection, this is the first time I’ve heard of one! 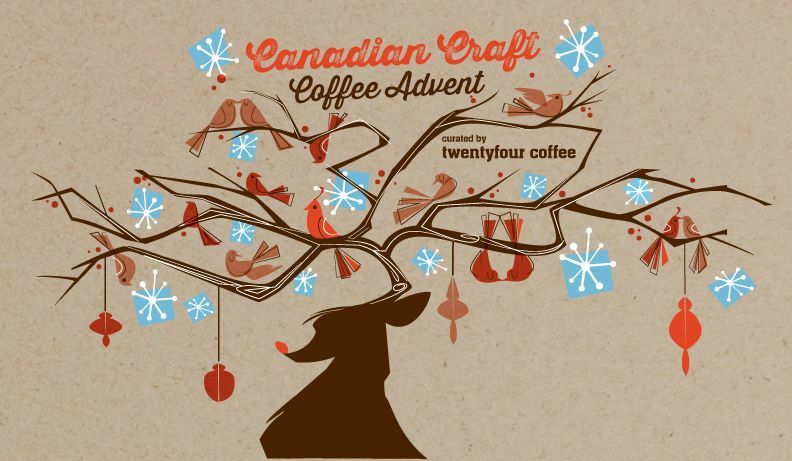 The advent calendar would have 24 different 2oz coffees from a handful of independent Canadian coffee roasters like Transcend Coffee, which is a local favorite of mine. I really love this project not just because it speaks to my caffeine loving soul or that it is fulfilling a need I never knew I had, but because it’s a local project that is promoting independent coffee roasters. I can’t wait to see what coffee roasters across the country have to offer or even ones here in Edmonton as I haven’t tried all of them yet either. There are lots of interesting advent calendars these days (not just those cheap chocolate ones) and I think this one will find a place with coffee lovers everywhere (it only ships to Canada and the US for now). For more information about the kickstarter campaign, check out their campaign page! Living La Vida Local to me isn’t only about buying local, but also supporting local initiatives and projects, so I have already pledged my $120 (I’m putting my money where my mouth is :p) in hopes of receiving a craft coffee advent calendar if the kickstarter gets funded. I know a total of $120 ($95 for the calendar and $25 for shipping) sounds like a lot but really it works out to $10/month or 2 lattes or 5 regular coffees, which isn’t really that much when I think about how much I spend on coffee each month. For those that are leery of spending $120, there is also a $30 reward which would give you a sample pack of 3 random coffees, so you could still get the advent calendar feeling on a smaller budget! There is a twitter/facebook contest going on as well where you can enter to win 1 of 5 craft coffee advent calendars (provided the project gets funded). So, if you’re a coffee fan. I would encourage you to check out twentyfour coffee’s project and support them in whatever way you can, whether it is actually funding them or just sharing their project with others! I have been thinking about which local business I wanted to talk about next and I have a great list of places in Edmonton that I love, but wanted to focus on one that is a little newer or maybe less well known, so it’s very serendipitous that I recently learned about Yellow House Consignment. I originally found Yellow House Consignment on Instagram where the owner Miranda posts photos of all the beautiful items she has for sale. I chatted with Miranda for a few minutes at her open house event and learned that Yellow House Consignment has only been open for about 3 months. She said that she does take items in from consignors in addition to purchasing some from thrift shops etc. Miranda is already full for summer consignors, but she may be opening up space for consignors in the Fall – I know that I will probably be contacting her about consigning a few things once I get around to cleaning my closet! Miranda hosted an open house this past weekend and I was able to pop over after running a few errands to check out everything she had in stock. The quantity of clothing was actually quite surprising to me since Yellow House Consignment is run out of Miranda’s home and items are generally either sold via facebook, instagram or appointments. There were several racks of clothing and lots of these had not been photographed and posted online yet. I wish I had a nice photo to show y’all but unfortunately, the sun was streaming in through the wrong angle for me to capture all the racks. Miranda has a lot of great brands (I saw Anthopologie, Michael Kors, BCBG and more) and she even had items from local designers like Fridget Apparel!